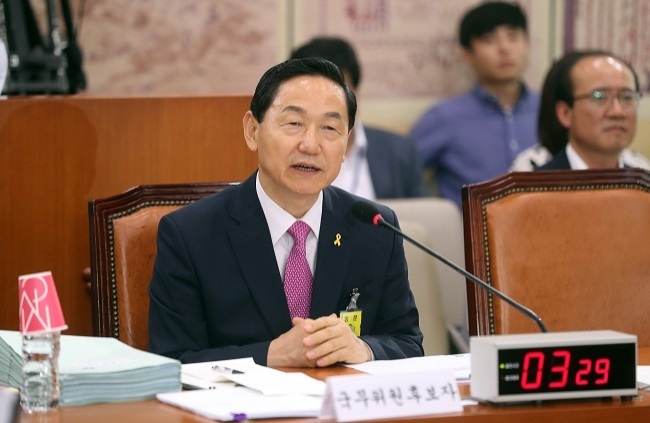 The nominee to serve as South Korea’s top education official vowed to promote equality in education and monitor the increasingly competitive educational system here during his parliamentary confirmation hearing Thursday. Kim Sang-kon, the former education superintendent of Gyeonggi Province, told a panel of lawmakers that he would bring about “equal opportunities for all students” in education and get rid of the sense of privilege and excessive competition entrenched in the country’s education system. Opposition lawmakers grilled the nominee on allegations of ethical lapses, including suspicions of academic plagiarism. “Kim is under suspicion of plagiarizing his Ph.D. dissertation and repeatedly publishing same papers by only changing a few parts,” Rep. Lee Eun-jae of the centrist People’s Party said. Kim categorically denied suspicions, saying that he was following the Korea Research Foundation’s demand to publish several of his papers and that the Seoul National University Committee on Research Integrity had concluded he did not commit plagiarism. “I did not plagiarize. I am speaking out of my conscience as a scholar,” Kim said. He went on to say that he would consider resignation, if his claim turns out to be untrue. In a statement last week, the main opposition party called Kim and two other nominees for chiefs of the defense and labor ministries the “unfit trio,” heralding a tough road ahead for the nominees. Kim also faces criticism for his pro-North Korea ideological leaning. In 2005, Kim argued for the withdrawal of the US Forces Korea and the end of the Korea-US alliance when he was a professor of Hanshin University. The parliamentary panel will submit a report on the hearing to a plenary session. Kim’s appointment does not require a parliamentary vote.